Hello everyone!! So last night Courtney from GaGa for Nails and I had a little chat and it inspired me!! 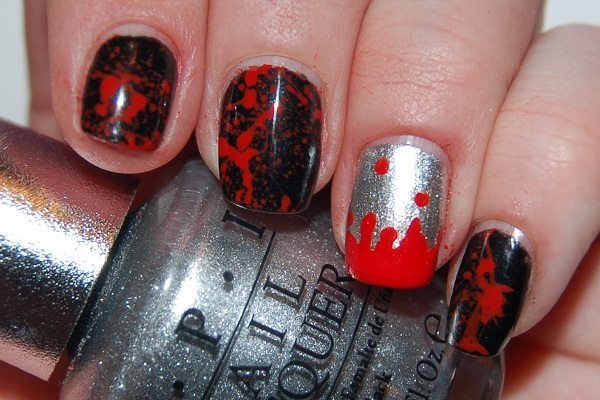 I ended up watching Tim Burton's Sweeney Todd and got my nails did!! The cleanup with this was rough, being that I used acrylic paint, but I am still very pleased!! Zoya Raven, OPI DS Radiance, Acrylic paint. I don't know if any of you have seen Sweeney Todd, but you need to! The staged version is AWESOME as well. So if you can get your hands on that, or the Burton film, you won't be displeased. Who says musicals can't be awesome?! The silver represents his razor, just so everyone knows! Disclaimer: It's a gory film. But it's totally the most ridiculous fake blood you'd ever see, so it's more laughable than not! So I work at a theatre. A real one! So everyone there knows Sondheim's Sweeney Todd and they all totally loved this design. I think it is fun. Probably more for Halloween, but I think it suits all year long! What do you think? Any other movies I should be inspired by?? PS - Yes, I love Dexter. 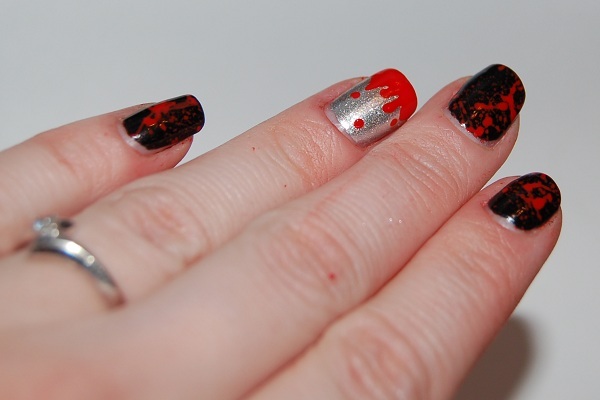 No, these are not my Dexter nails, although I have done those in the past and most likely will again someday! Pps - Don't forget, you can like me on Facebook! I can't tell you how STOKED I was to find out that my 2 favorite actors (Depp and Rickman) were teaming up in my favorite musical, directed by my favorite guy! I was a very obnoxious person to be around before it hit theaters.. THIS. IS. AMAZING. I'm so glad you chose to watch our man and get inspired, lolol. Freaking love it. It was the movie case. I grabbed it and thought, why not! So I popped the film in and had my own little party. 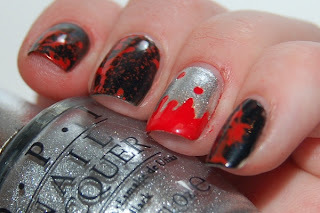 This is such a fun mani! Cool! I love splattes and sweeney todd so great combo! I looked at them and thought DEXTER too! Hahahaha...they are sersiously cool nails! This mani is sick! It looks so amazing. I thought it was the nail strips stickers before I read what you wrote, that's how perfect this looks.. Awesome job! I am very pleased with how it turned out! Thanks for your kind words! Wow this is great and so creative! I am really loving your blog, i just stumbled onto it recently and am now a new follower!